It seems like the jailbreak community has been waiting to announce all its cool little tweaks together, and another to add to the list brings some new and useful information to the iOS WiFi settings app. Called WiFi Booster, this little tweak makes a couple of interesting little alterations to the Settings app’s WiFi options and making them more useful in the process. 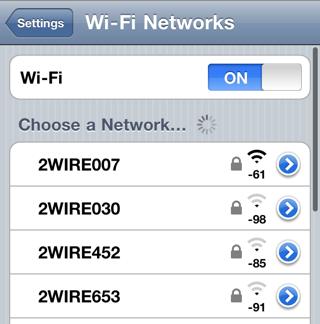 The main feature of WiFi Booster is to reduce the signal threshold at which WiFi hotspots are shown in Settings. By default, hotspots with a perceived quality below a set threshold are hidden from users so we don’t try to connect to networks that Apple deems too far away. After installing WiFi Booster this threshold is removed, meaning all networks detected are presented to users. The other feature we quite like is the tweak’s ability to check the MAC address of the router running the network. This address is then shown beneath the name of the network inside Settings. WiFi Booster is available to download from the jailbreak App Store, Cydia, right now for $1.99. Obviously if you’re going to install WiFi Booster you’ll need to have a jailbroken iOS device. If you’re not already jailbroken we have a couple of guides to help you with jailbreaking iOS 4.3.3 (untethered) using Redsn0w here. Running iOS 5? No problem! If you’re playing around with Apple’s iOS 5 beta 1 then you can apply a tethered jailbreak via Redsn0w, explained here, or by using Sn0wbreeze.